Reuben Mourad - If there’s one piece of gym equipment that’s misused more than any other, it’s potentially the rower. The ergometer, or erg, as it’s affectionately known by rowers, is one of the most powerful pieces of apparatus on the gym floor. Anyone that knows this has a love hate relationship with it, as despite its ability to really carve up your body, it can also be one painfully sweaty workout. Yet, despite this widespread understanding that the rowing machine can give you one of the best full body workouts going around, it’s actually incredible to see how often this device is used improperly, often both to the detriment of the quality of workout, but also, at risk to the athlete. I’ve seen literally hundreds of gym goers, professional athletes, crossfitters, and even trainers getting on an ergometer, and thrashing around furiously, without any form or attention to technique, and there’s a subsequent frustration when rowers feel like they’re putting in a ton of work without getting anywhere. The secret formula to the perfect stroke, well, isn’t that complicated (or secret). In fact, it lies in three words: legs, body, arms. Despite what a lot of people think, rowing isn’t just an upper body workout. Your arms shouldn’t in fact, be doing all the work, or even most of it. Your legs are the biggest supplier of power in each stroke, and should subsequently, be the focus of your energy. Let me explain the three words mentioned earlier: legs, body, arms. Those three areas are basically an order of what should be moving through the stroke. The first thing, and the only thing, that should start a stroke are your legs. They’re the most powerful part of your body - stronger than your arms, so you need to use them to your advantage. You want to drive your heels into the foot pads, and really fully extend them with power at the beginning of each stroke, before you even think about moving any other part of your body. 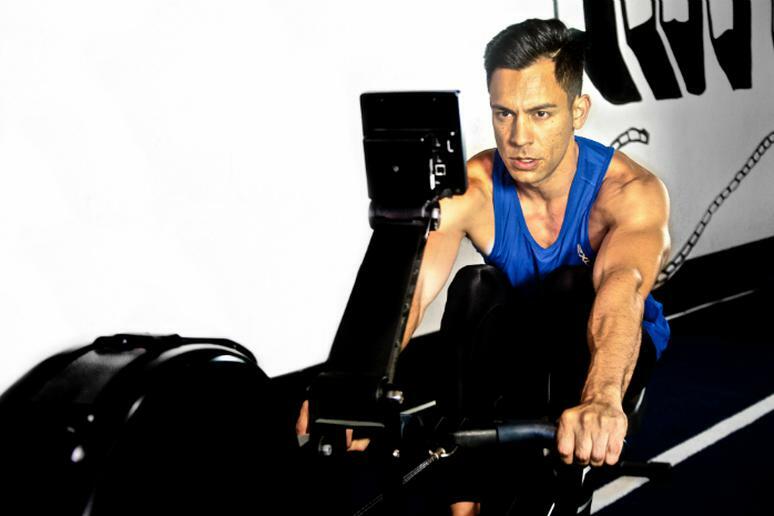 In order to do this most efficiently, you’ll need to have the seat of the ergometer close to your heels, which in turn, will give you the fullest range of motion. If your legs are absolutely smoked by the end of your workout, it’s a good sign you’ve worked them on each stroke. When I refer to “body”, I’m talking about your hips and your abs - basically the midsection of your body. Your upper body needs to be in a neutral position through the stroke, which in turn results in your core being engaged. A lot of people slouch over during their stroke, and subsequently, don’t end up engaging their core, or using enough of their legs, and rely on their arms to push them. The idea here, is to pivot at your hips, so that your upper body leans slightly back to around 100 degrees, after you’ve fully extended your legs. The very final step in this sequence is to finish up with the arms. Your arms are the last piece of the movement, and should only become active when your legs have been extended, and your upper body pivots backwards at the hips. From here, your hands come right up to your lower chest. For guys, this should be about where you’d lower the bar on a bench press, and for girls, it’s just below your bra line. Be sure to engage your upper back muscles when conducting this pulling motion, and relax your shoulders. Your spine should be neutral at all times, and this includes the very end of your stroke. Your arms finish bent, but not sticking out from your body, rather, aim to have your elbows finish behind you. You don’t want to pull your hands to your chest too early, as they’ll have to jump over your knees - remember, you’re only moving your arms once your legs have been extended, and your upper body tilts back. You need the oar in your hands to go in a smooth motion, back and forth with a minimal amount of resistance or change in direction, so always make sure it’s the final movement you take. The movement back, or the recovery, is the reverse order of what we’ve been talking about, that is, arms, body legs. Lead with your hands, push them forward, tilt your body forward, then bend your knees as you slide your seat towards your heels. The basic takeaway from today is that you should only move your body in this sequence - legs, upper body, arms. And then the reverse for the recovery. Like a deadlift, the sequence of movements relies on a logical pattern, which allows your body to be as streamlined and efficient. This isn’t to say that this is the be all and end all of rowing technique - there’s a lot more to it, without question. But, this is a great, and easy, start for those new to rowing. Simply remember the order, and repeat the mantra to yourself; legs, body, arms, every time you execute a stroke, and the reverse when you’re in the recovery phase of your stroke. This order will ensure that you’re using your whole body, with an emphasis on a strong and powerful movement from the legs, every single stroke. Reuben Mourad is an international television host and journalist, based in Los Angeles. You can follow his fitness, food, and travel adventures around the world on Instagram, @reubenmourad.